​WE ARE A PERSONAL TRAINER COMPANY IN TORONTO FOCUSED ON CLIENT RESULTS. 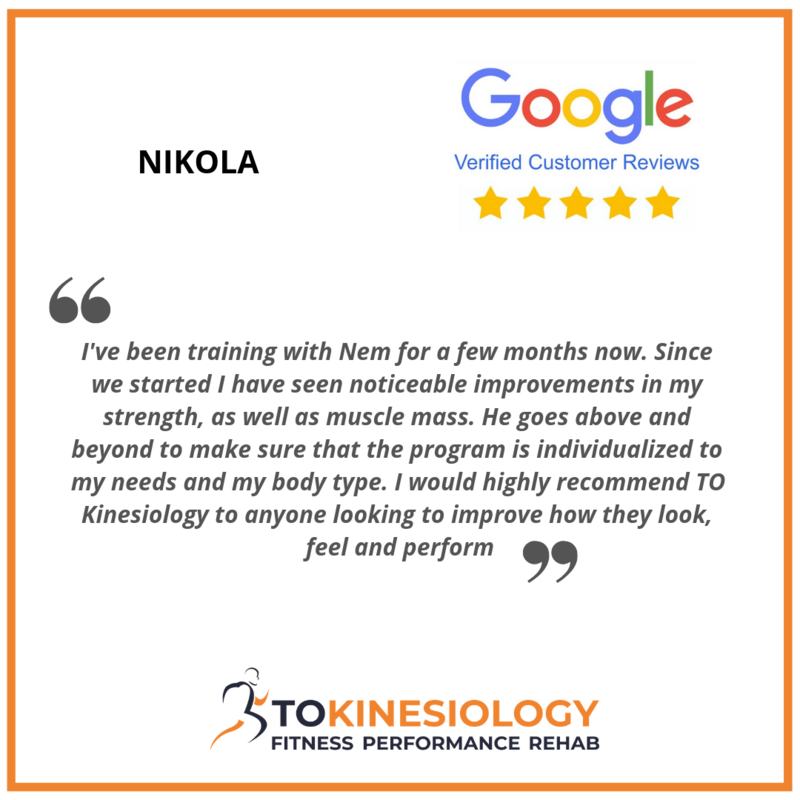 TO Kinesiology is a Toronto-based company focused on providing professional in-home, condo or gym personal training, kinesiology and nutrition coaching services. Work with a Certified Personal Trainer and Registered Kinesiologist with a Master of Science degree in Kinesiology. Aside from getting a professional and quality service, this also means you might be eligible for a full or a partial refund on our services. Our approach - our methods are based on science and our extensive experience working with people just like you. We helped numerous people lose weight, tone, gain muscle mass, get rid off pain and improve sports performance. We understand that we are all different with unique physiologies and body mechanics and therefore everyone needs a different approach. We will track various parameters to ensure that we are progressing at the right pace and modify exercise and nutrition based on your feedback. Client-relationship - we take your results seriously. We only work with a limited number of clients and can only take you on as a client if we are sure we can help you. This ensures that you get the service and attention that you need. As soon as you become our client, you results become our results and we will go above and beyond to ensure that we succeed. 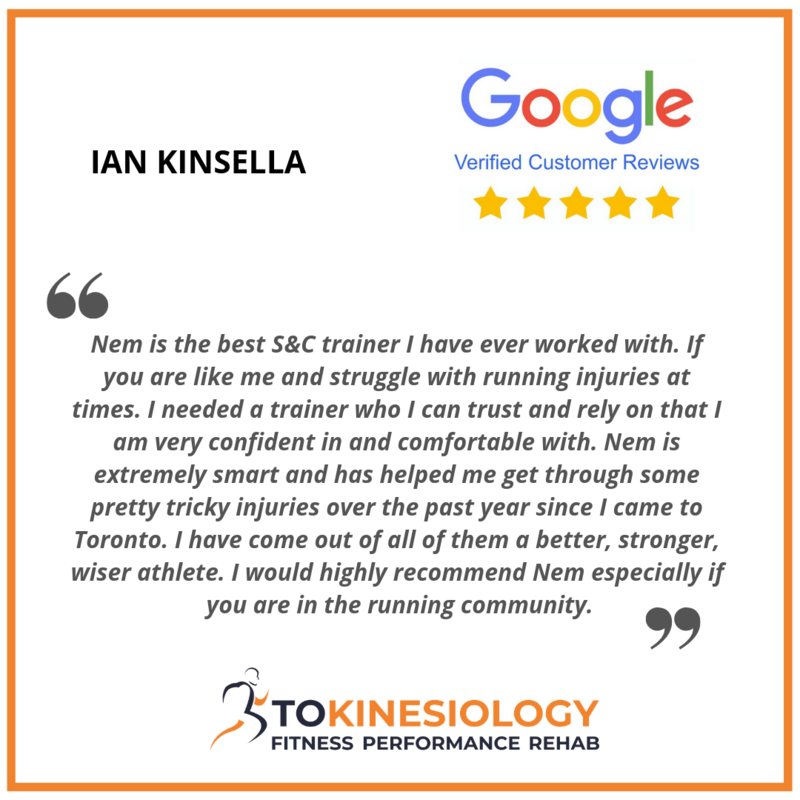 Registered Kinesiologist are experts in human movement and performance with at least four-year Kinesiology university degree. Kinesiologist are regulated by the College of Kinesiologist of Ontario put in place by Government of Canada to ensure public safety and quality of service. You can claim our services as a medical expense with CRA and since most extended health care benefit plans cover Kinesiology, you might be eligible to get a refund. 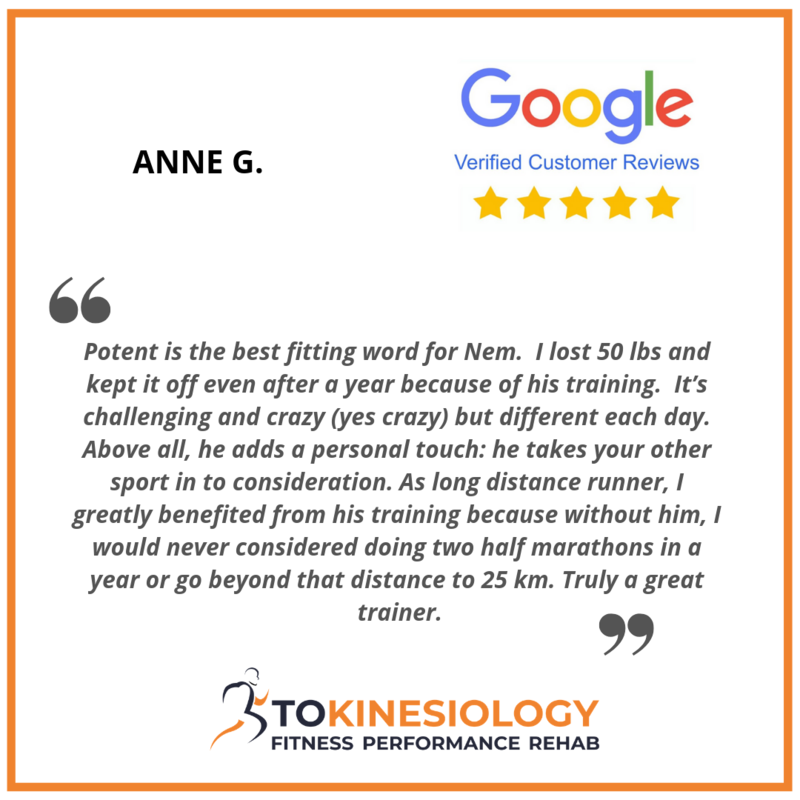 ​Nemanja Sambaher (Nem) is a Certified Personal Trainer and Registered Kinesiologist in Toronto with a Master of Science degree in Kinesiology. Nem has been involved in the health and fitness field for more than 10 years specializing in strength training, weight loss, muscle gain, sports performance, and injury rehabilitation. Nem is a published author with a strong science background. His work has been featured in scientific journals like Neuroscience, Scandinavian Journal of Medicine and Science in Sports and Journal of Strength and Conditioning Research. As a writer, Nem contributed for online publications like Stack.com, Running Room and Applied Physiology, Nutrition and Metabolism. Having experience in a clinical setting, corporate environment, fitness industry and as a university researcher, Nem offers a unique approach to health and fitness. As a kinesiologist and a personal trainer, Nem helps people improve the way they move, look and feel. 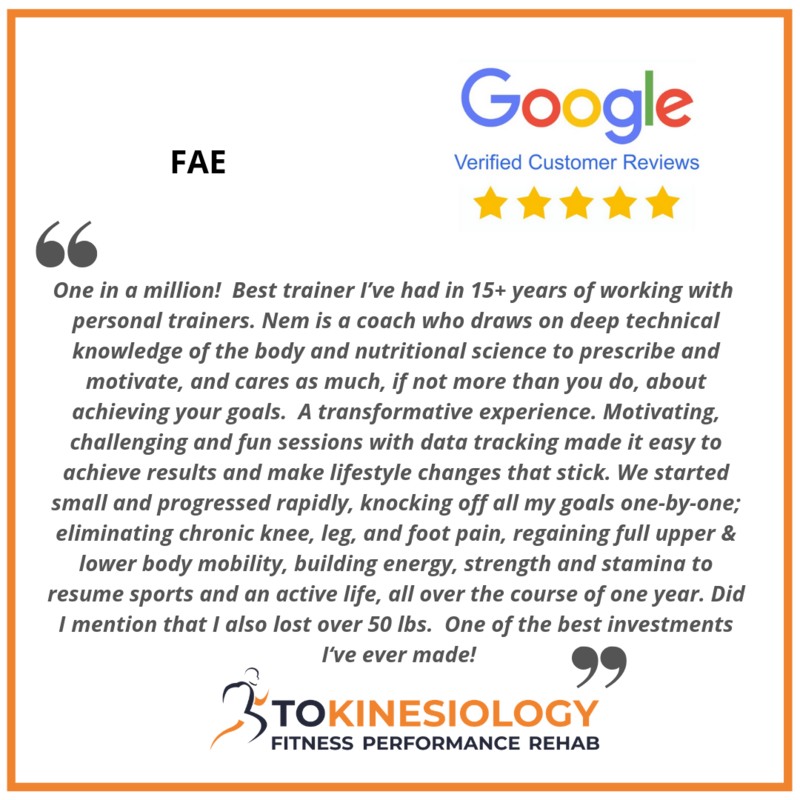 His exercise and nutrition coaching has allowed his clients to gain strength and muscle, lose body fat, eliminate pain and improve physical performance and health. His clinical work includes electrocardiogram testing, phlebotomy, lung function assessment, movement and gait analysis. Using exercise as a therapeutic modality he has prescribed and carried out rehabilitation programs for patients with various injuries and chronic diseases like heart disease, diabetes, Parkinson’s disease, Alzheimer’s disease, rheumatoid arthritis, cancer survivors and many others. 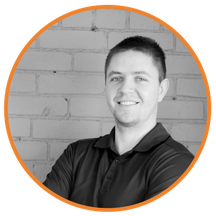 Most recently to further improve the client experience and enhance results, he has introduced a TO Kinesiology mobile app. This not only allows Nem to take on clients from all over the world, but also allows current clients to have 24/7 access to their TO Kinesiology trainer along with a full video exercise library, nutrition coaching tools, and progress tracking software. Nem believes in the power of Kinesiology and proper exercise prescription for all Canadians looking to improve health and fitness. In his work with clients, Nem combines elements of strength training, hands-on therapy, conditioning and rehabilitation to maximize results and ensure a holistic approach. You can learn more about Nem on his LinkedIn page. To schedule a session with Nem, get in touch with us here. If you are looking to take control of your health and fitness and somebody who truly cares about your results and who will above and beyond to help you succeed then we are here for you. No matter what your lifestyle or goals, we will make sure that you get the results you are after. Get in touch with us to get started right away. We are looking forward to hearing from you.